The GBP to EUR exchange rate has not finished its decline nor has the Bank of England finished cutting interest rates say analysts at DNB Markets. Sterling has not closed below €1.1520 in 2016 - but fresh analysis on the GBP/EUR's outlook suggests such an event is highly likely. According to Norway’s DNB Markets, whose predictive capabilities have impressed us in the past, there are a number of compelling reasons to expect further weakness. According to analysts, uncertainty looms and dovish monetary policy moves at the Bank of England will weigh on the GBP. Hence the bank are forecasting an additional cut to 0.1% in November at the Bank. This view chimes with the observations made by MPC member Minouche Shafik on Wednesday the 28th September when she said further policy easing was likely over coming months. DNB Markets do acknowledge that sentiment has reversed its initial deterioration with UK GDP growth rising to 2.2% saar in Q1, driven by strong consumption growth. They also note the labour market continues to tighten while wage and price inflation is on an uptrend. Furthermore, sentiment indices have recouped the Brexit-induced losses. With regards to the European Central Bank (ECB) side of the equation, we take a rather bullish reading from DNB. Analysts note that Eurozone growth is positive, but anaemic. Sentiment, credit growth, unemployment, inflation and interest rates are all stable. As such, that the ECB offered no changes at the September 8th meeting was to be expected. DNB say they believe inflation will pick up further, lowering the need for ECB to act now. But inflation growth will have its limits and should slow anew over coming months ensuring the ECB will extend its Asset Purchase Programme but taper to zero by Aug-18. This is by no means the ‘bazooka’ that many now believe the ECB must fire if it were to achieve any notable Euro weakness. There is even talk that a new approach to stimulate Eurozone growth will need to be adopted by the ECB in coming months, and as we note here this could well lead to Euro strength. As can be seen by the below model, the difference between interest rates, ultimately a function of central bank policy-making, will remain a key driving force behind the Euro’s expected ascent against Pound Sterling. As the BoE cuts closer to the ECB's 0% base rate the interest rate differential (light blue line) diminishes. However, for the GBP/EUR exchange rate it is not the Bank of England, nor the European Central Bank, that is likely to provide the largest downside pressure on the Pound. “We see structural/long term effects as the main worry. Uncertainty will remain high as negotiations of Brexit and trade agreements prevails,” say DNB. The call comes as Pound Sterling languishes near its 2016 lows against the Euro, Dollar and other major currencies with analysts citing uncertainty over the shape, form and timing of impending Brexit negotiations. This is likely to be an ongoing source of weakness for the UK currency. DNB Markets also join those analysts that point out that the UK’s trade deficit will leverage strong downforces. This is equates to a GBP into EUR exchange rate of 1.1111. In March 2017 (six month timeframe) analysts forecast EUR/GBP at 0.88. This is a GBP into EUR exchange rate of 1.1364. 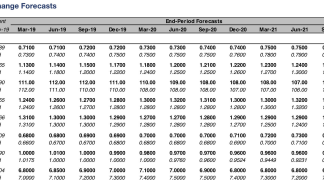 By December (three month forecast) the EUR/GBP is forecast at 0.87, this is a GBP into EUR exchange rate of 1.1494. As DNB are a Norwegian bank, those with an interest in the Krone will be interested in noting the GBP/NOK pair is forecast at 10.23 by the end of 2017 and 10.00 in March 2017. The twelve month forecast target is seen at 9.67. By way of contrast, we note fellow Scandinavian institution Danske Bank have GBP/EUR forecast to move even lower than this. Also by way of contrast, where both Danske and DNB Markets see further downside others say the worst of the Pound’s weakness now behind it (ABN Amro, Barclays). Another notable call from the Norwegian bank is that the Dollar's period of dominance is over. Analysts tell clients that the latest long-term Dollar uptrend cycle has come to an end. "The EMU/US growth divergence is all but gone, with worries over a US recession growing. EMU recovery anemic, but downside risks gradually reduced," say DNB. Analysts foresee a very gradual Fed tightening cycle (+25bp in 2016, +25bp in 2017 which could lift USD demand temporary. However, a higher oil price will help see a weaker USD. The presidential election in November is a risk factor. EMU inflation pressures will remain muted and the ECB will be forced to do more. Even more expansive ECB policy will weigh on euro appetite, but is in the price. Long term (>1Y), abating downside risks in the EMU and current account surplus will support the EUR. 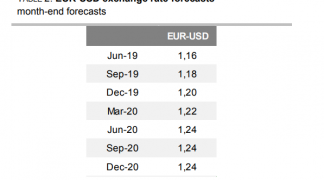 "We stick to our forecast of EURUSD rising towards 1.15 in 12 months," say DNB. Unfortunately the bank has not provided forecasts for GBP/USD but we would assume the pair could be better supported than GBP/EUR in light of the comments on the Dollar in General.